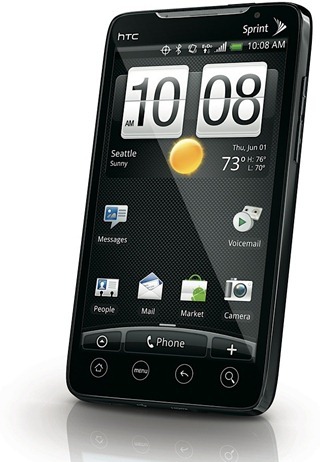 Sprint’s newly accounted HTC EVO 4G is no doubt a phone which packs a punch inside out. It is partially a HTC HD2, running Android 2.1 on top of it. That is something to brag about! Take a look at this hands-on review of this superb device. The hardware specifications of this phone are somewhat similar to those of the HD2 but differs in some places especially memory and battery, it hosts a powerful 1GHz Snapdragon processor, A huge 4.3 inch TFT LCD display with a resolution of 480 x 800 pixels, 1GB of built-in internal memory, and 512 MB of RAM which ensures smooth running of apps running simultaneously. The camera has been improved now, it’s an 8 megapixels camera with a flash, the forward facing camera for making video calls is 1.3 megapixels. No doubt that this phone is a monster in terms of it’s hardware and multimedia capabilities, it even does 720p video recording! With the help of an adapter, you can take an HDMI output to your TV or any other device to view your multimedia on. It supports Wi-Fi 802.11b/g, would’ve been even better if did 802.11n. The battery is of higher capacity than that of HD2’s. The phone runs on Android 2.1 (same as Nexus One with Live Wallpapers), with the new version of HTC Sense on top of it which makes the whole experience of using the phone even better. The device is very responsive and fast. The thing that sets this phone apart from every other phone is that it’s Sprint’s first 4G phone, it’s still in testing stages though, but anything beyond 3G has to be good in terms of speed and performance, we really can’t wait for the device to come out and see it in action. Engadget has gone hands-on with the device, here it is in action! The price of the phone hasn’t been disclosed yet, but Sprint says that we should expect it’s release during Summer, that’s not that far away, but the features and hardware this phone packs, it’s definitely worth the wait. if u notice the hands on video from begining u can notice that the touch sensibility is not as smooth as iphone…he tried scrolling with his finger which did not work properly…i wud still go for iphone 4g releasing on june 21 over this one as it will rock….